Rome is 275 km from Florence. The roads are all Autostrada toll highways. But what should have been a 2 1/2 hour ride turned into almost 5 hours. The five accidents held us up for at least an hour and then there was the 40 minute wait to pay the toll. Driving inside of Rome was easier than getting to Rome. We found our apartment right away, found a parking space close so we could empty the bags and then brought the car over to the parking garage on the other side of the River Tevere (I still don’t understand why the English call it the Tiber). Our apartment near Piazza del Popolo is comfortable and modern in décor but it’s obvious that no one really lives here. It was made as a rental business which is fine with us. The furniture is Italian modern but the place has been pretty much set up as a rental apartment for Americans. All the appliances (TV, washing machine and clothes dryer) come with English directions, which is helpful since none of them work anything like what we have back home. The clothes dryer, for example has no exhaust hose, and so the moisture from the wet clothing is collected into a water reservoir which needs to be emptied anywhere from 1-3 times during the drying, which by the way, takes a minimum of 2 hours per load. There’s a guest book in the apartment full of recollections concerning the peculiarities of the washer, dryer and satellite TV, as well as restaurant choices, grocery stores, warnings about using the toilets when someone is in the shower and a “heads up” about the American hating neighbor who tosses beer on the heads of the guests from her 3rd story window. This seems to have been a one time incident, but we do look up every time we leave the Palazzo. 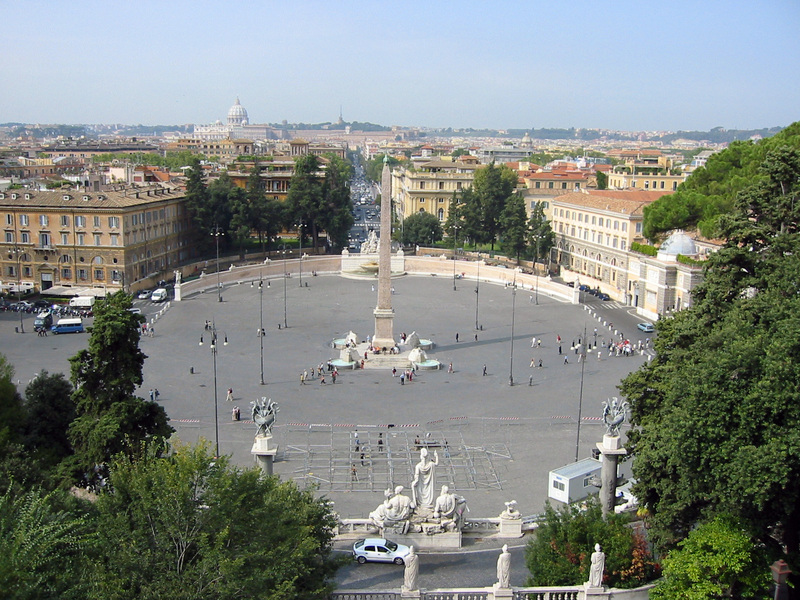 We are 2 blocks from the Piazza del Popolo, one of the grand squares of Rome. In the 16th century the Piazza was used for public executions as convicted criminals were whacked to death with big hammer blows to the head. Today, it’s one of the quieter areas of historical Rome and we are finding it has a nice neighborhood feel; grocery stores, butchers shops, wine stores, bars, cafes, bookstores, restaurants. If we need more, Piazza di Spagna and the couture of Rome is a 5-10 minute walk. Tourists have been coming to this city for over 2300 years. And they keep on coming. Everywhere you turn, there’s another treasure. One city was built on another. A modern city built on a Christian city built on a pagan city that was built on a previous pagan city. There is no shortage of building materials and what was once a Temple to a Roman god became the bits and pieces for a catholic church or someone’s palazzo. Domitian’s stadium became Piazza Navona. Hadrian’s burial tomb became Castel St Angelo. The Imperial Fori became Mussolini’s grand city street that connects Piazza Venezia to the Coliseum. There is so much to do and see. Every time we come here, it’s as if we’re here for the first time. Everything old looks new again. 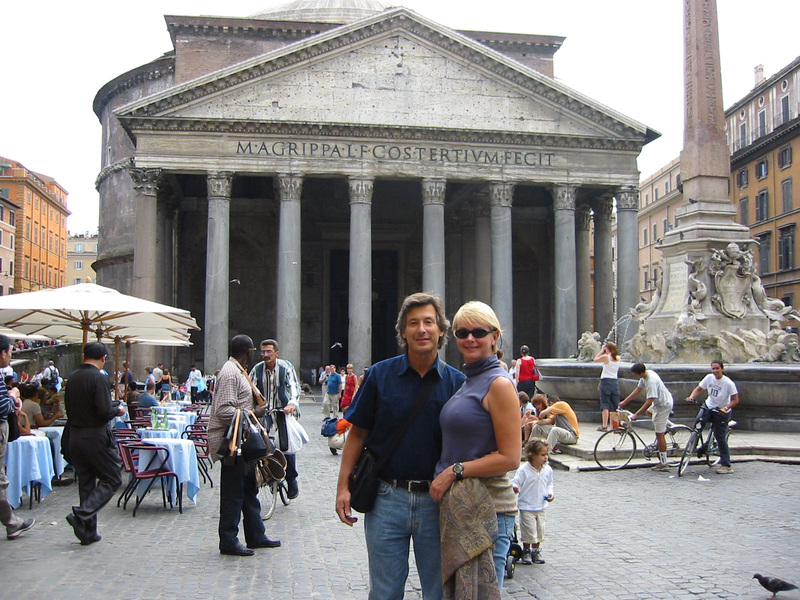 The Forum, Trajan’s market, The Theatre of Marcellus, The Pantheon, Nero’s Domus Aureas , the Coliseum and all the other remains of the old glory. The Coliseum remains the centerpiece of Ancient Rome. The Emperor Tiberius basically gave the Romans this sports arena for free. No charge to anyone, although the better seats did go to the wealthier citizens. Slave labor was plentiful in those days, and it helped that Nero’s artificial lake that used to occupy the property already had a good foundation, but still, when you look at this thing and realize it was built in only 10 years, it is a humbling experience. And take the blue Metro B Line to E.U.R. 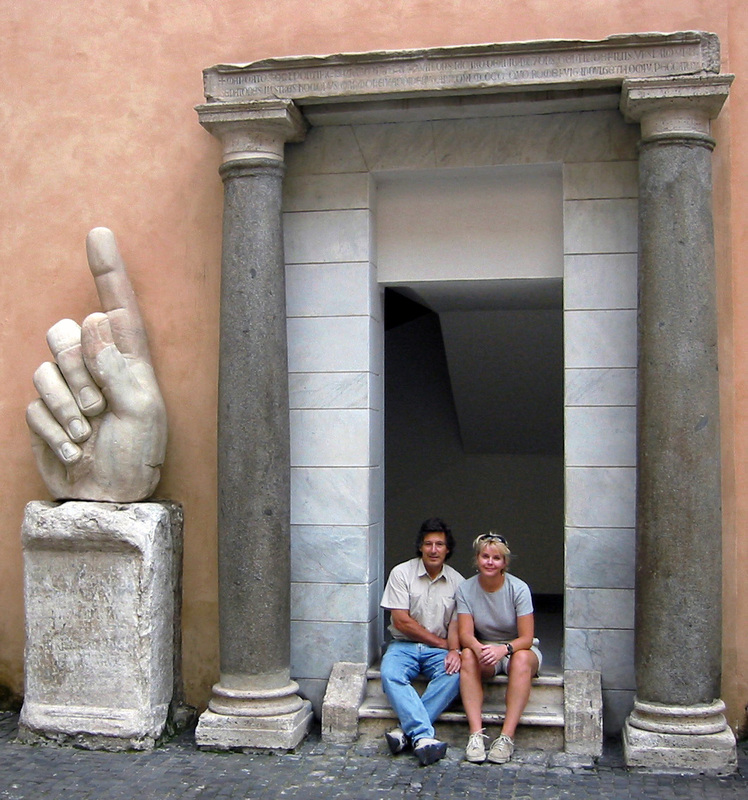 to visit the Museo Civilta Romana to see the large scale model of ancient Rome. EUR, Mussolini’s model city of the future, is pretty weird but the model of ancient Rome is worth the visit. 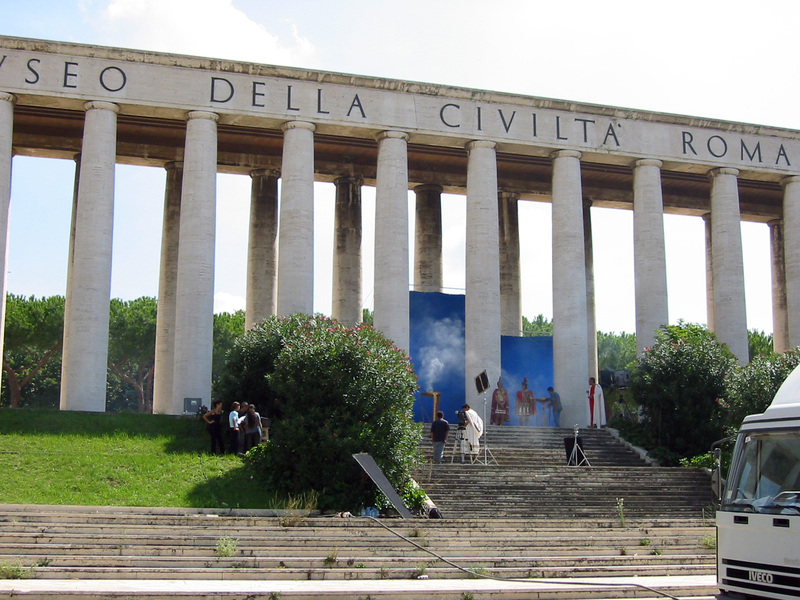 While we were at the Museo Della Civilta Rome to see the scale model of ancient Rome, we happened upon a “sword and sand” film production. You never know what you’ll run into. A side note. Do not try to stop the metro train door from closing with your knee (or any other part of your body). Take it from us, it will just result in a big bruise. How could you not appreciate a guy who used prostitutes, thieves and street urchins as models for his paintings? In his own way, Caravaggio took the sinners and the poor and transformed them into immortal saints. For Caravaggio enthusiasts, Rome is the place. His paintings in the dimly lit churches of Santa Maria del Popolo and St Luigi dei Francesci and are as they’ve been since the 1600’s, although we now have the advantage of a few lights bulbs so cleverly timed that visitors need to constantly pump 1 euro coins for 2 minutes of bad lighting. As one of the founders of the Baroque age, Bernini’s hand is everywhere. At age 15, he carved two children drinking milk from a goat; at age 19-22 he created the mythological themed masterpieces that still sit in their original location at the Galleria Borghese. While Bernini was an elitist snob who charged gobs of lira working mostly for the Popes or other wealthy families of Rome, Borromini, on the other hand, had an argumentative temper, dressed in common work clothes and never really liked anyone, including himself. He eventually killed himself with his own sword at age 68, while Bernini lived and worked till he was 82. Their rivalry is famous throughout Roman lore. Supposedly, Bernini once hired Borromini for a project and then stiffed him on the payment. That pretty much started their rivalry. When a tower that Bernini designed for the face of St Peter’s Cathedral fell down, Borromini seized the opportunity to slam the reputation of his rival and gain a few new Papal projects for himself. At the completion of Bernini’s Fountain of Four rivers in Piazza Navonna, Borromini told the Papal authorities the obelisk that sat on top of the sculpture wasn’t safe and would soon fall over. When the Papal authorities confronted Bernini, he tied a piece of twine to the obelisk, fastened the other end to a building and laughed all the way home. Another great story about Michelangelo: Upon completion of the Pieta, a most amazing piece of art, it was opened for public viewing. The crowd was overwhelmed with its sincere and serene beauty. Michelangelo stood in the back of the crowd waiting to hear words of praise for the sculptor, but unfortunately no one spoke a word of the artist. Not a breath of his name was mentioned. He was so angry, that later on that night, he crept back into the Cathedral and carved his name into the statue. It’s the only piece he ever signed. Coffee came to Rome in the 16th century by the Venetians. Since then it has become a real art form. Let’s face it, this is the country of espresso, cappuccino, café latte, macchiato and so on. Yes, there are many good cups of coffee here but it was well worth the trip to Piazza Sant’Eustachio and the Bar Sant’Eustacho. Even the romans agree, it’s the best coffee in the world. Tazza D’Oro near the Piazza del Rotunda is another great coffee. 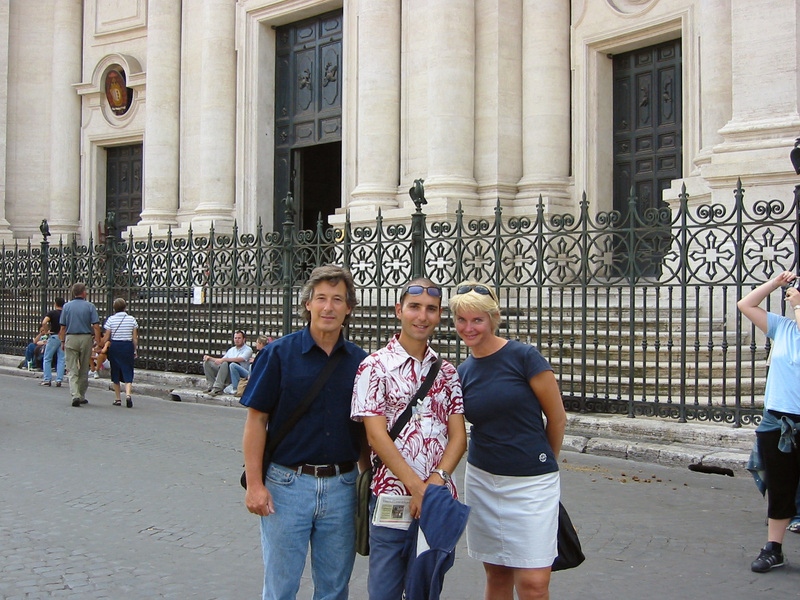 There are hundreds, if not thousands of churches in Rome. Sure, you can see great examples of Renaissance, Gothic and Baroque art and architecture. Some, like Santa Maria del Popolo and St Luigi dei Francesci are worth the visit for the Caravaggio paintings. St Agnes and San Giovanni in Laterano are worth the trip for the Borromini architecture and fat stucco angels. Bernini, Michelangelo and Rafael have their signatures in more than a few. But if you have only one church to visit, we recommend San Clemente. This is the only church, if not the only place in Rome where you can actually see three levels of history working in one place. The bottom level has an original temple (and waiting room) to Mithras, a rival religious cult to Christianity in the early days. An original statue of Mithras killing a bull still exists in its original location. You can also see the old Roman streets, barely wide enough to fit a person through. The next layer up shows the early 4th century church of San Clemente, which was destroyed and sacked in the 1049. The crypt of Father Cyril (the originator of the Cyrillic writing still used in Russia and Greece is also on this level). Then on top is a beautiful mixture of Byzantine and Baroque with some incredible mosaics. We hired Massmilliano Canetto. 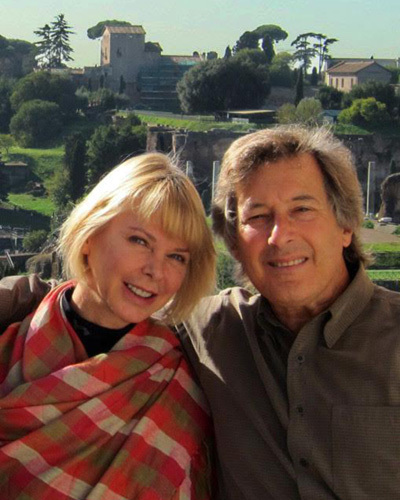 Sure, we’ve been to the Vatican and the Galleria Borghese on previous visits. We’ve stomped around the Coliseum and paid tribute to the tomb of Bernini in Santa Maria Maggiore. We read the travel books, even read a few history books. But there is something you get from a good guide that you can never find in any book. We buzzed around the city, bypassing the crowds of tourists, looking into the more obscure and thus even more delightful. We learned the “Lore and the Gore”. While other tourists were visiting the paintings and sculptures of Galleria Doria Pamphilj, we were learning about the life of Donna Olympia Pampilj or the evil “pimpacia” as she was known to her contemporaries. This sister-in-law to Pope Innocent X, became a most influential lady of Rome, some say she was the Pope’s lover and referred to her as the Popessa. She worked her power to acquire a fortune, collecting money from all the whores in Rome as well as the loot she accumulated from her boyfriend the Pope. In fact when Innocent X died, Pimpacia took all the money and split town. Innocent X lay dead and unattended in his bed for 3 days while everyone in the Vatican looked for the money. It took them 3 days to realize Pimpacia escaped with all of it. In fact, as Massmilliano tells us, there is still a legend today that says every night; the ghost of Pimpacia rides a fiery carriage filled with treasure from the Pampilj Palazzo in Piazza Navonna across the Ponte Sisto. While looking through the fabulous art collection of the Galleria Borghese, we also got a great insight into Cardinal Scipioni Borghese. This favorite nephew of the Pope was “pazzo” for art. He would buy it, steal it, imprison artists until they would sell works to him for his asking price and then display it in this amazing Palazzo. Walking across the Ponte St Angelo, Massmilliano told us how the Piazza was once used for public executions. Beatrice Cenci killed her father after he raped her. Many Romans still revere her as a symbol of injustice. We’ve been told you must eat your weight each year in gelato, or if you only have a week, divide your weight by 52. But let’s see, since I’m only here for a week, I can eat a years worth now and pro rate it over the next 52 weeks when I won’t be able to eat any gelato. I don’t know how they do it, but they do make it fresh every day, sometimes 3 or 4 times a day, and carry it out to the storefront in bathtub size containers. The gelato in and around Florence is wonderful. I had always considered it the finest in the world. But the Romans have taken gelato to a new art form with flavors you could never imagine. We had melon gelato, frozen rice gelato, bounty bar or mars bar gelato. Some of the gelateria took five minutes just to view the flavors, a mind boggling array of anywhere up to 50 varieties. By the way. The 6 weeks of Italian lessons has really paid off. Just a few words open up every conversation and we’re treated more like guests than visitors. It’s fun to speak and it has opened up so many new doors.